Lake Okushima (奥四万湖) is an artificial lake located Shima Onsen, Gunma Pref. The lake is made by Shimagawa Dam. 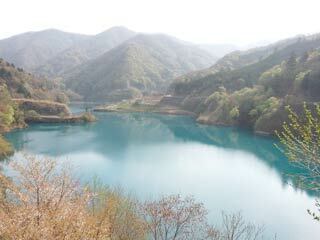 Unlike other artificial lakes, the water of Lake Okushima has pure blue water. Not only it has beautiful blue-green color, its transparency is very high. In Summer time, you can enjoy beautiful green leaves, and in Fall, they will be colored with beautiful autumn leaves. There is a parking and restroom. You can walk over the Dam. There are many view points. Also, there is a public Onsen. Catchment area 28.4 km sqr. It is one of the most beautiful lakes in Japan.